The United States Code of Federal Regulations (CFR) is a compilation of the general and permanent rules published in the Federal Register by the Executive departments and agencies of the Federal Government of the United States of America. It is sometimes referred to as the "United States Code", "U.S. Code" or "USC". The U.S. Federal Register is published on each day following a government working day. It is the official daily publication for Rules, Proposed Rules, and Notices of Federal agencies and organizations, as well as Executive Orders and other Presidential Documents. The CFR is constantly updated and changed as new laws are passed and old ones expire. When consulting the U.S. Code, be certain that you are using the latest edition. "22 USC 1501" refers to Title 22, Section 1501. "2 USC Sec. 285b" refers to Title 2, Section 285b. "49 CFR 173.124" refers to Title 49, Section 173.124. "CFR 29 1910.1200" refers to Title 29, Section 1910.1200. 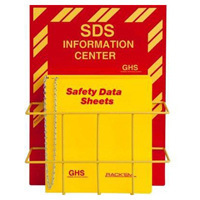 Many of the items discussed on an SDS (including the SDS itself) are defined in the U.S. Code. This includes the activities of OSHA, DOT and other federal agencies such as the Environmental Protection Agency (EPA). To search the U.S. Code, follow the links given below. Ensure your workers are trained to federal standards with safety posters and more at Safety Emporium. Browse the U.S. Code at the U.S. National Archives and Records Administration (contains both current and previous versions). Search the United States Code at the U.S. House of Representatives Office of the Law Revision Counsel. Search the U.S. Code at the Legal Information Institute of Cornell University. Search the US Code of Federal Regulations at the Federal Digital System (FDsys; formerly known as GPO Access). USA.gov - the U.S. Government's official web site for searching the government. See also: CERCLA, OSHA, RCRA, SARA.